The Flying Faucet is a free Bitcoin faucet that rewards visitors with free coins and the amount you get depends on your luck – 75, 150, 300, 1500 or 10000 satoshi. You can request a dispense from the faucet every hour with higher chance to get a lower reward and lower chance as the award amount goes higher. The service uses Microwallet micropayment service, so your winnings are transferred there immediately and you need to accumulate at least 5825 satoshi before they are sent to your Bitcoin wallet. The good thing is you can fill in the Microwallet account with other faucets as well and get to the minimum pretty fast. The NeoBitcoin Faucet is a free Bitcoin faucet that gives visitors free coins, all you have to do is to enter your Bitcoin wallet address and you can earn between 300 and 10000 satoshi, and you can keep requesting more every 30 minutes. The faucet sends your coins directly to the Bitcoin wallet address that you use to login and request a dispense, but in order to be able to cashout you will need to collect at least 6000 satoshi in your balance. 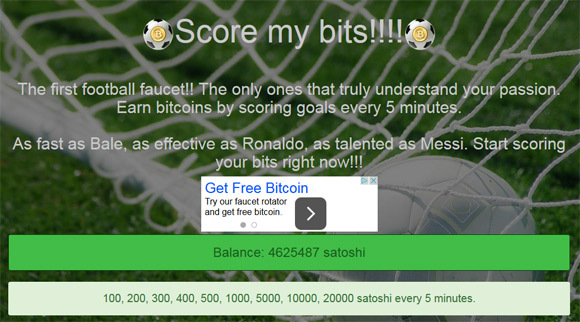 The Score my Bits Faucet is football themed Bitcoin faucet that gives you the chance to win 100, 200, 300, 400, 500, 1000, 5000, 10000 or 20000 satoshi every 5 minutes. The faucet supports direct payment to a free Bitcoin wallet from Xapo for immediate payment to your account or payment through FaucetBox micropayment account where you need to accumulate minimum 13000 satoshi in order for the service to transfer them directly to your Bitcoin wallet address. To make some additional coins you can use the affiliate program that gives you 20% extra referral bonus if you invite your friends to the Bitcoin faucet and they start using it. They will still get their full reward from the faucet and you get an extra 20% bonus.